Wet shaving is finally starting to pick up steam once again. Back in the day this form of shaving was the most popular due to its effectiveness at producing a ridiculously close shave and leaving the skin feeling baby-bottom smooth. This method has quickly been pushed to the back-burner thanks to corporate companies like Gillette shoving cartridge razors down the public’s throat. Now, however, people are beginning to realize that using a traditional razor along with a good cream and a proper brush they can get a better quality shave and it’s less expensive. It’s important to realize, however, that you do need a few different tools for wet shaving. It’s not all just about the razor. Obviously a good razor is important to have, but you’ve also got to use a good, sharp razor blades, a cream that can lather up well, and, as we stated before, a good shaving brush. The brush is probably the most overlooked tool of them all, but it’s extremely important! A good one, like the Perfecto 100% Pure Badger Shaving Brush, can easily bring your overall shave from alright to perfection. Down below, we provide a full review of this brush to help you see what makes it so great. Looking for a brush that has high-quality hairs, exfoliates the skin thoroughly, helps bring water to the skin for a proper wet shave, and lathers up shaving cream for optimal results? Well, you’ll definitely want to check out this Perfecto shaving brush then. It’s an excellent brush that will significantly improve your shaving experience without breaking the bank. It even fits beautifully in the Perfecto Deluxe Razor and Brush Stand to round off a great set of shaving tools. The most important aspect of any shaving brush are the hairs used in the head. In order to build up a good lather, scrub the skin well, and distribute shave cream properly you’ve got to have a brush with quality hairs. This Perfecto brush is loaded with 100% pure badger hairs. These hairs aren’t brittle, they conform to the edges of your face well, and they move around cream exceptionally well. On top of that they’re also excellent for retaining water and warmth. Most men like to use a lukewarm or even hot water while wet shaving for a comfortable, soothing feeling. In order to trap the heat of the water, though, you’ve got to have a good brush. This brush perfectly locks in water and heat so you get a comfy, soothing shave each and every time. The number one job of a shaving brush is creating lather. Let me be the first to tell you, this little brush can make some seriously thick and rich lather with both cream and gel. The hairs are thick and strong so they really mix the cream well, producing a very luxurious lather. This brush does a superb job of making lather, perhaps better than even some of the more expensive brushes. The lather is essential to getting a good, clean shave. You won’t be disappointed with this brush. Want the Best Lather and the Closest Shave? CLICK HERE to Get this Awesome Shaving Brush for the BEST Price Possible! On Amazon.com the Perfecto Pure Badger Shaving Brush is the #1 best-seller when it comes to wet shaving brushes. This is definitely one of the most popular entry model brushes you can buy to get started. The price for this particular brush varies greatly depending on where you buy it. A lot of local retailers and shaving shops offer it for $30 or so, but it can be purchased for a lot cheaper. We tell you where we suggest getting the brush down below. It’s definitely worth reading because it’ll save you a ton of money! You should buy most of your wet shaving goods from Amazon, anyhow. Blades, razors, and everything else you need are almost always cheaper on this site. Not to mention they ship all orders out incredibly fast and provide outstanding customer service. We always recommend using Amazon when you can. Click here to Order the Perfecto 100% Pure Badger Shaving Brush from Amazon Now! 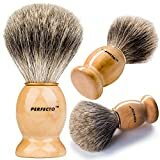 You can look at my Shaving Brush review guide if you had something else in mind or if you are looking for something a bit more fancy and expensive.